Home Entertainment Movie Reviews The Good The Bad The Weird – Spaghetti Eastern hits Hollywood! The Good The Bad The Weird – Spaghetti Eastern hits Hollywood! 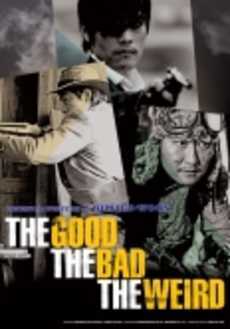 The Good is Do-Won (Bounty Hunter, a Korean Dirty Harry), The Bad is Chang-yi (Head Honcho, raving psycho) and The Weird is Tae-Goo (petty thief, murders if necessary). These three Korean exiles duke it out in a Chinese desert and if this all sounds a little bizarre that’s because it is but as everything roller coasts out of control, curiosity overwhelms, and you just have to sit out the ride. There is a map of some buried treasure so fabled it is coveted by the highest (the Japanese army) to the lowest (the Asian desert bandits), with our three heroes sandwiched between. Rumors of the mystery cache spread like Chinese whispers and as dreams of opulence grow so the urge to find the missing map overwhelm and a frantic blood lust fills the air. The final battle scenes stretch across the vast desert and the dust settles over our three heroes as they find themselves face to face with the buried treasure beneath their very feet. The director/writer states that this is a story about three men who engage in a chase across Manchuria and basically that’s what it is, but unfortunately the story is filled with so many other warring factions that at times it becomes confusing and if you’re not sure who’s axing who to pieces, who are you supposed to cheer for? And with so much else going on we hardly get to know Do-Won and learn little more about Chang-yi, who, psychotic tendencies aside, could be a fun guy to hang out with. He has hair like Prince, always wears a smart three-piece pin stripe and turns down the offer of a free ride because “Bandits don’t use tickets to get on trains, they stop them.” How cool is that? The only person we get to know is Tae-Goo which makes it appear that it’s his story, but this is not the writer’s intent. The final battle scenes are beautifully drawn and, although there is great momentum, all those extra bodies present a difficulty of their own and when they disappear a few minutes later so that our three heroes can be alone, the silence is deafening. The filmmakers make a feeble attempt to justify their sudden absence which simply doesn’t work and as the payoff has a couple of great twists there is an even bigger question why a more succinct story has not been told.